I only started watching Sentai with Shinkenger. 1. Tokumei Sentai Go-Busters – Amazing. It featured a strong, dramatic, emotional storyline, but didn’t forget to have a little fun to help put things into perspective. It had legitimate and truly surprising twists that kept things exciting. The tweaked formula helped the season feel fresh. It had a large group of likeable characters (human and not) and a deliciously crafty and slick villain. It had a great, talented cast. But maybe, most importantly, Tokumei Sentai Go-Busters started a journey and satisfyingly concluded it. And that conclusion couldn’t have worked without having plenty of heart and emotional connection. 1. Ressha Sentai ToQger – ToQger has many similar qualities. Which is probably why it’s tied for my #1. I absolutely love the idea of childhood friends “growing up” to become superheroes. The ToQgers embarking on a journey to find their home gave the season a sort of nostalgic feel. And that helped me feel connected to the story faster than any other Sentai or PR season ever did. I was immediately invested in the ToQgers regaining their memories and finding their hometown. They are fun and likeable characters. And like other toku seasons, it is a big win if you can balance a generally darker story or undercurrent through the season while still being bright and fun. It has an incredibly charming ensemble cast. The villains have some of the best story and character development I’ve ever seen. And the amount of heart that helps make those emotional climaxes effective really resonates with me. 3. Samurai Sentai Shinkenger – My first full Sentai season. And I loved it. There are lots of twists and turns through the 49 episodes, like any genre show, with an intricately woven mythology. We see the relationships between the Shinkengers develop, relationships between the villains, and even get to see some very good backstory on both our heroes and the villains. Shinkenger has a great cast, very likable, and made their characters people you’d want to spend time with. It was very refreshing watching Shinkenger, almost like a reboot of Power Rangers itself for me personally. A little more exciting, a little deeper, a little more action than your typical Power Rangers. Like I credit Wild Force with bringing me back to Power Rangers after so many years, Shinkenger will now always hold a special place in my TV heart as the series that brought me into the world of Super Sentai. 4. 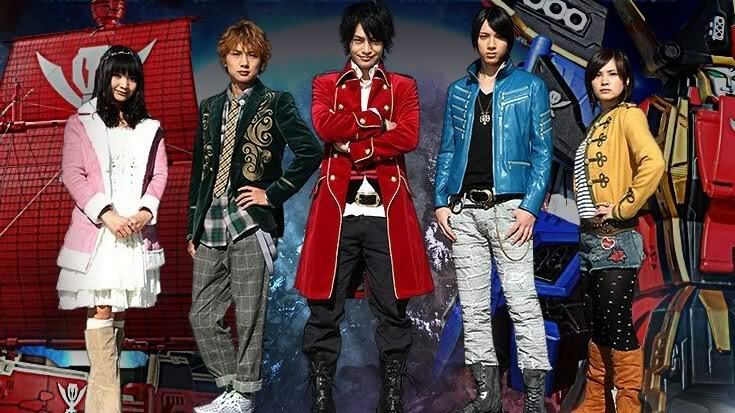 Kaizoku Sentai Gokaiger – Gokaiger is pure fun, but with just enough substance and more than a touch of sentimentality to appeal to anyone from longtime fans to the uninitiated new fan (like myself). Whether it’s the action, the characters, or the nostalgia, you’ll find at least one thing, if not all of ‘em, to keep you entertained for 25 minutes every week. Great cast. 5. Tensou Sentai Goseiger – It’s either Goseiger or Kyoryuger for this last spot, but I haven’t watched half of Kyoryuger yet. But even so, Goseiger easily gets my #5 slot. One of the biggest accomplishments of Tensou Sentai Goseiger is how it handled the balance of its outright slapstick goofiness and the heavier, legitimately more dramatic story turns. But while it isn’t a favorite amongst Sentai fans and it lacks some of what makes Shinkenger and Gokaiger such great seasons, Goseiger is a completely satisfying and fun experience. A great story, a likeable cast, fun characters, and epic villains. 1. Power Rangers RPM – Just a completely unexpected season. It has everything I look for in a season of PR or Sentai. That is, great characters, great actors, great writing. It had a serious, dramatic story that was balanced with plenty of lighthearted, funny and fun moments. It was a creative and fresh season that showed PR has a lot of potential, especially in the hands of people who actually care about crafting a good story while still being able to sell toys. It is also a season that is emotionally satisfying. 2. Power Rangers DinoThunder – My favorite season until RPM. And it had many of the same qualities. Great characters, actors and writing. Maybe a more back to basics, simpler premise, yet still effective. Some missed opportunities, no doubt. But the dynamic between the core three was great fun and Mesogog is still one of the best PR villains. Plus, the fact that they were able to work around JDF’s absence without skipping a beat is a great accomplishment. DinoThunder is a great season in spite of JDF, not because of him. 3. Power Rangers Operation Overdrive – One of my absolutely favorite premises of any PR season. I love the idea of globetrotting, treasure hunting Rangers as well as the idea that the Rangers came from around the world as well. I especially liked the serialized nature of the season, which perfectly fit with the idea of a continuing, season-long hunt for jewels. The villain factions was also a great concept, but definitely could’ve been used a little better. So for me, the premise and the effort put into conceptualizing and executing the story (whether they succeeded or not) is more than can be said for many other seasons. iMack was an excellent twist and done very well. James MacLurcan and Rod Lousich gave some of the best performances on PR. But maybe the biggest reason OO easily tops many others: Spencer. One of the best PR characters ever and David Weatherley, likewise, also one of the best actors on PR ever. 4. Power Rangers Wild Force – WF will always hold a special place in my heart because it was the season that got me back into Power Rangers after I guess losing interest around season 3. Specifically, “The Master’s Last Stand” was the episode that wowed me and made me look up Power Rangers again. Okay cast, but a great story, especially the entire Viktor Adler/Master Org plotline. He murdered Cole’s parents out of jealously for goodness sakes! 5. Power Rangers Time Force – Of the pre-WF seasons that I only discovered after getting back into Power Rangers, Time Force was the one I enjoyed the most. A solid cast with a great story. But this spot could easily be shared by Lost Galaxy, Ninja Storm and Mystic Force as well. ← Recap: Kamen Rider Drive, Episode 11 – Who Can Prevent the Dark Eve? Well, I thought it was executed fine even if they dropped the ball on a couple of things. But that can be said for every PR season. I just enjoy OO more than the majority of PR seasons, really and I sincerely like a lot of what OO brought to the table and the eventual end product.